Terming those hindering the security forces' anti-terror operations as "supporters of terrorists", and warning them of "stern actions", the chief of army staff said that the security forces are also acting against those involved in terror funding and aiding and abetting terrorism. 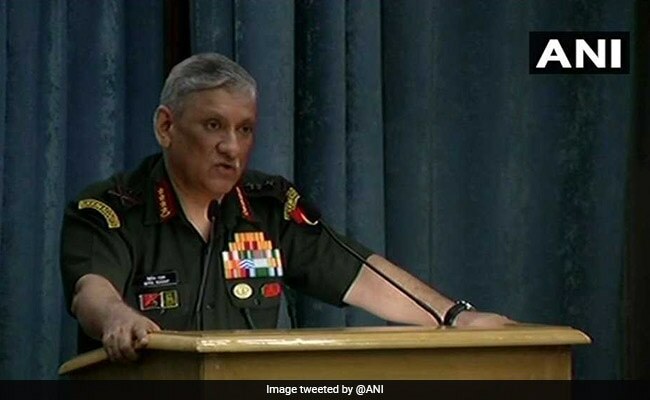 Army chief Bipin Rawat counselled radicalised youth, said terror outfits use them as "cannon fodder"
Army Chief General Bipin Rawat on Monday sought to counsel the youth in Kashmir having the propensity to veer off towards radical outfits to see through the designs of terror outfits, which only use them as "cannon fodder". Talking about the situation on the International Borders and the LoC, Gen Rawat said the infiltration was under control and the ceasefire violations by Pakistan army are being handled in a strong and effective manner. The army chief highlighted that attempts are being made to revive terrorism in Jammu region. Holding "misinformation and disinformation" campaigns responsible for the radicalisation of the youths in the Valley, the army chief called upon them to understand the terror outfits' designs. "The radicalisation is happening more because of the misinformation and disinformation campaigns. Youths are being fed with wrong and incorrect information," Gen Rawat said in a reply to a question by news agency PTI on the sidelines of a function to facilitate disabled soldiers. "The youths are being recruited by militant outfits through disinformation. And then, they don't even have any training and get eliminated in a few days," he added. Counselling the misguided youths to see through the designs of the terror outfits, the army chief said, "If they (radicalised youth) understand properly that they are being used as a cannon fodder, they will better shun violence and join mainstream." "And then there will be peace in valley. There will be jobs. Everything that we are looking for, will come that way," Gen Rawat added. Urging media to discard misinformation campaigns, he said the media has a major role to play in it and they need to come out with factual information. "Let people know the truth. Every time, when an action takes place, they are looking for media support and if you (media) give them that support and mileage, it will embolden them and do more actions," he added. Talking of those hindering anti-terror operations by security forces, Gen Rawat warned, "Whoever disrupts the security forces' operations, needs to be dealt with sternly." "Security forces conduct operations to neutralise those who are out to cause violence. But if some people out there prevent the security operations, stop them from eliminating militants and allow them to escape, they are simply the supporters of terrorists," said Gen Rawat. He added that the action is being taken also against those, who are aiding and abetting terrorism in the Valley. "Some of them finance militants and some provide them with information. Where ever such information is given, we take action," he added. On infiltration, the Army chief said the security forces' resolve to stop infiltration from across the border was intact. "We have been successful in stopping infiltration. Most of the terrorists operating are locals," he said, but added that the launch pads across the Line of Control are still active and they keep changing. "Their full efforts are focused on staging infiltration of terrorists into the state. As the winter is approaching, these infiltration attempts would increase. They would try to infiltrate but our troops are alert. They would foil their infiltration bids," Gen Rawat said.